Living amongst us are a group of creatures who prey on the vulnerable and the weak, guiding them to commit suicide and living off this energy released (known as "span") of a life snuffed out before its time. These Tormentas look just like a regular human, often taking the guise of a ravishing seductress or larger than life pop star, school bully or evil boss. Only the intervention of an ancient, secret sect prevent the Tormentas from gaining more power and taking over in force. But things are changing and a prophecy tells of a time when one will arise to unite these creatures against humanity and the only thing standing in their way are the two secret agents Lola and Bianca and the legend that one will also rise to thwart the evil. 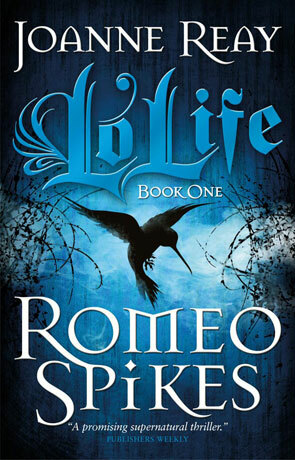 Like it's name, Romeo Spikes is an unusual, unexpected novel that at times feels like a young adult paranormal romance / thriller and at others a complex urban fantasy. This fusion of styles is both a blessing and a curse, if you begin expecting an easy reading, vacuous "paranormal" novel then you will be sorely disappointed as the book isn't like that at all; it isn't even really YA. The plot is complex with a number of threads that demands a great deal of attention to keep on top of, intricate and elaborate with a surreal edge. With a fairly large cast of characters and told through the eyes of a number of different protagonists, this book does take little getting used to. I don't think the name does the book any justice either, I understand the meaning behind it (romeo spikes are those railings and anti-climbing measures that end in a sharp spike) but I wouldn't expect everyone too and if they don't it could sound a little like a YA inspired soppy vampire. The authors ability to write entertaining prose should not be under-estimated, clever with a dark richness and dry humour that draws the reader in right from the start; capturing the attention with some witty, sassy dialogue. I eat six pounds of grapes a day. - That's a lot of grapes. Not when you squeeze them down to wine. With the complex, dynamic plot, multiple POV and sometimes detailed narrative comes a slightly uneven pace but one that does generally move the story forward while the tension builds towards the hugely satisfying finale that has you on the edge of your seat for the last 50 pages or so. The switch between characters is handled very well and not once was I left disorientated. I loved the place name where much of the story is set - "Morphic Fields" - it just sounds perfectly dark and fantastic. The charming and warm voice helps of course and really does mean that when things do get a little slow or the plot twists more than a politician on question time you are still quite comfortable enjoying the journey. The characters themselves are well drawn, if a little larger than life and occasionally over the top, although it does take time to really bond with the protagonists and without wishing to make the book any bigger a little more exposition on the major characters themselves would have helped. The use of Tormentas is also inspired and raises the very real, important subject of suicide and it's a real credit to the author that she has chosen to raise this serious issue that is still a major problem in today's society. Romeo Spikes is someone very different, remarkably ambitious and in a world with a vast realm of carbon copy "paranormal" fiction that is a good thing, a very good thing. This book isn't going to be for everyone though, if you are wanting an easy read that allows you to switch off a large portion of your brain then you should look elsewhere. However if you are wanting to read something that stands out from the crowd, something that makes you think, that offers a level of complexity rarely seen within the genre or the start of a highly promising fantasy series then look no further. Written on 2nd November 2012 by Ant.